Unless you’re wealthy or you plan to be soon, please do yourself a favor: don’t buy a rare project car. It won’t be fun at all, and your wallet will end up a shriveled, dry mess, possibly in a dumpster in a back alley somewhere. In the last installment of the “lessons from Dave” wrenching series that I literally just made up, I talked about how buying a vehicle with the big engine option isn’t necessarily a great idea, citing serviceability as the primary issue. But this time, there’s a new lesson: don’t buy a rare vehicle unless it’s worth a lot, or unless you’re worth a lot. Twice now, I’ve made this mistake. 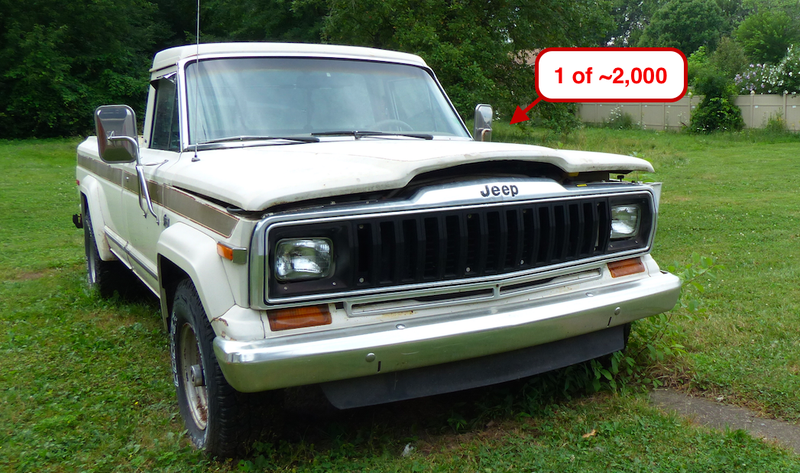 My 1985 Jeep J10 pickup is, according a cursory online search, one of only about 2,000 J10s built that year. And my 1979 Jeep Cherokee Golden Eagle is probably similarly uncommon. My T177 shifter, whose threaded end I broke off while wrenching, is also not likely to be replaced anytime soon, because even though I can find a lever that works (from a CJ’s T176 transmission), I have yet to find one bent in the proper shape. My Jeep Cherokee Golden Eagle has also been giving me grief on the parts availability front. See that chrome strip at the base of the rear glass below? It’s a part of the window seal, and though I can find rubber seals off of Grand Wagoneers all day, I want the chrome. Because chrome, especially on old trucks, is just lovely. Sadly, there’s just not a big enough aftermarket for these Cherokee Chiefs, and not nearly enough in junkyards. That’s why I’m deathly afraid of sitting in my Jeep with oily clothes. If I ruin these seats (they’re already far from perfect), finding new ones is going to be a full time job. And finding “Western Weave” cloth to have the buckets reupholstered? Forget about it. My J10 will be a lot simpler, since it’s just a basic vinyl bench, but boy would it be nice to be able to go to a junkyard, and have a popsicle’s chance in hell at maybe finding a decent bench to simply bolt in. These are just a few of the issues I’m having finding parts on my rare, but still not particularly valuably Jeeps. Still, I have to admit that working on my J10 and my Cherokee Golden Eagle just isn’t as fun as working on my XJ Cherokees or even my Willys CJ-2A. Parts availability is so important when it comes keeping a project moving along. It’s not just about money—because after all, you can get any part if you’re willing to spend enough—it’s about being able to easily find good quality components, especially fragile components like rubber seals and plastic bumper end caps. Otherwise, the project drags on, and there’s nothing fun about that.